Welcome to Geocortex Reporting. Geocortex Reporting enables you to create sophisticated, professional-looking reports that include spatial and non-spatial data from ArcGIS map services, tables, databases, and other data sources. Reports are authored using a web-based tool called Geocortex Report Designer. Report Designer has an extensive suite of tools for laying out reports, specifying the data that you want to include, and presenting the data using charts, tables, and other configurable elements. 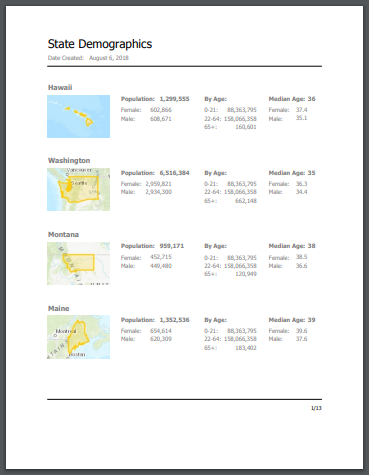 Sharing reports with end users allows them to create on-demand, print-ready PDF reports about maps and features, using data from the user's current session. End users run reports from Geocortex viewers and Web AppBuilder for ArcGIS apps. If you use Geocortex Workflow, you can also configure workflows to run reports. To configure a Web AppBuilder app to host a report, you use a custom widget that was developed by Geocortex for this purpose. The user clicks the widget to run the report. Geocortex Reporting can run in two environments—in the cloud or on premises. In the cloud version of Geocortex Reporting, you use the cloud offering of Geocortex Report Designer to design reports. Reports are saved to Geocortex Reporting in the cloud, with an item for each report in your ArcGIS Online account. Reports run in Geocortex Reporting in the cloud. In the on-premises version, you use your on-premises deployment of Geocortex Report Designer to design reports. Reports are saved to your on-premises deployment of Geocortex Reporting, with an item for each report in your Portal for ArcGIS account or in an ArcGIS Online account. Reports run in your on-premises deployment of Geocortex Reporting. You can either create a report from scratch, or create a report from a template that preconfigures the report for a particular purpose. Using a template allows you to skip some of the following steps. Add a data source to the report. This allows you to include data from the data source in the report. Before you can add a data source to a report, you must configure the data source's connection information. You only need to do this once, and then you can add the data source to any report that you author. Configure the query that will get the data for the report. You may want to add filter conditions that restrict the records that the query returns. A common type of filter condition used in layer reports restricts the records to the features that are currently selected by the user. Add bands that define the report's structure, like headers, footers, and data areas. Add data fields and other content to the report. Format the content. Run the report in Report Designer's embedded Preview environment to verify it. Make any changes you want and re-preview the report until you are satisfied. Reports are saved to the Geocortex Reporting service, with an item in your ArcGIS account. To share the report with end users so they can run it, share the ArcGIS report item. You can also share a report with other report authors so they can copy or modify the report. Configure an application to host the report. Reports can be hosted by Geocortex Viewer for HTML5 viewers or Web AppBuilder apps. Alternatively, if you use Geocortex Workflow, the application can host a Geocortex workflow that runs the report. Hosting in Web AppBuilder uses a custom widget developed by Geocortex for this purpose. Run the report from the host application. When prompted, download and open the PDF.